Author John Irving’s novel about a boy with a “wrecked voice” who believes he’s an instrument of God is a staple on high school summer reading lists. Here are a few things you might not have known about it. 1. THE FIRST SENTENCE IS IRVING’S FAVORITE. 2. IRVING BASED OWEN MEANY ON A CHILDHOOD FRIEND. That jogged Irving’s memory. Russell had moved away before they had become teenagers, and had been killed in Vietnam. “I was amazed,” Irving writes. “I said one of the stupidest things I’ve ever said. ‘But he was too small to go to Vietnam!’ My friends looked at me with pity and concern. ‘Johnny,’ one of them said, ‘I presume he grew.’ That night I lay awake in bed, pondering the ‘What if...’ that is the beginning of every novel for me. What if he didn’t grow? I was thinking.” Irving would later incorporate the memory of passing Russell over the heads of kids in Sunday School into a scene in Owen Meany. 3. THE BOOK IS FULL OF HOMAGES TO OTHER NOVELS. 4. HESTER IN OWEN MEANY IS SIMILAR TO ANOTHER OF IRVING’S CHARACTERS. 6. IRVING DID HIS RESEARCH. The author writes Owen’s weird “wrecked voice” in all caps. When asked to describe what the voice sounds like to him, Irving told the Denver Post that “There's gravel damage, rock dust, granite quarry residue, in Owen's throat; he probably has what they call ‘singers' polyps.’ It is a damaged-sounding voice; it has to strain. It's always a little harsh-sounding—never soft. It's irritating to listen to—like the effect of those capital letters, I thought. It's an insistent voice—one that demands to be heard.” Another important reason it was necessary: In the novel's climactic scene, where he saves a group of Vietnamese children at an airport from the grenade-wielding half-brother of a dead soldier, “Owen has to have a voice the Vietnamese children will pay attention to, which is why he also has to be small,” Irving said. 8. THE NOVEL IS PARTIALLY A COMMENTARY ON AMERICANS’ OBSESSION WITH SPORTS. We certainly celebrate sports, and sports heroes, more than we honor the arts, or any number of intellectual achievements. We are a sports culture. … This is a novel about the damage Americans do to themselves; sports are a part of that damage. If world news were covered as extensively, and in such detail, as the ceaseless March Madness over college basketball, wouldn't Americans be better informed about the world, and our place in it, than we are? … It's not literally, of course, that sports are killing us; but what we pay intense attention to it, and what we ignore is surely doing us some harm. And, as a former wrestler who is bored to tears by basketball, I thought: What possibly good reason can there be for insanely practicing sinking a basketball when you're Owen Meany's size? Well, how about saving the lives of children? In my view, there's no other good reason for it! 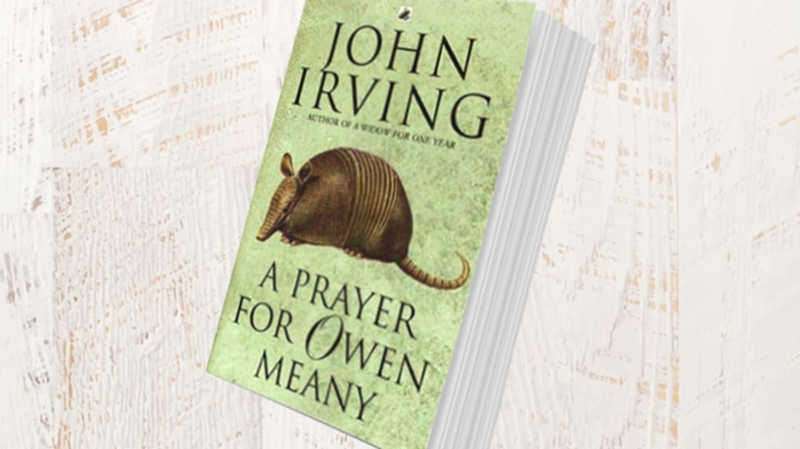 In A Prayer for Owen Meany, Johnny Wheelwright escapes Vietnam after Owen cuts off part of his trigger finger with a diamond wheel—but Irving didn’t qualify for service because he was a Kennedy father. “In 1963, relatively early in the Vietnam War, President Kennedy issued an executive order saying if you were the father of a child, and that child's necessary means of support, you were not to be drafted into military service,” Irving told the Denver Post. The author got married and had a son while he was still in college, so he went from a student deferment to a Kennedy father deferment. But that didn’t make him feel lucky. “I felt disappointed. I wanted to be a writer; therefore, I wanted to see what the war was like,” he said. “Years later, of course, I realized how lucky I'd been. That child—he's in his 40s now, with children of his own—reminds me from time to time about it. Whenever we get in an argument of some kind, he says, ‘Don't forget who kept you out of Vietnam.’” The deferment ended in 1970. 10. … BUT HE INSISTS THE CHARACTER ISN’T AUTOBIOGRAPHICAL. 11. IT COULD HAVE BEEN HIS FOURTH NUMBER ONE NOVEL. 12. IRVING HAS MIXED FEELINGS ABOUT THE BOOK’S SPOT ON HIGH SCHOOL READING LISTS. I remember—this was mainly in high school—hating some of the novels I was required to read, though in most cases these required books introduced me to many of my favorite authors. In the area of Vermont where I live, I visit schools where my novels are taught; I've attended a fair number of A.P. English classes, just to talk to the kids and answer their questions. I'm lucky, as a writer, that I've always maintained a very young audience; that my novels are taught in courses, both in high school and at colleges and universities, helps to keep the age of my audience young. That matters more to me at sixty-six than it once did. 13. IT WAS ADAPTED INTO A MOVIE. Afterward, rumors circulated that Irving had hated the movie. “Mark took an unfair bashing in the American press,” Irving told The Guardian. “People wrote that I hated the film and took my title away. That is untrue.” He told The Guardian that the book is unfilmable because “film is two-dimensional. What you see is real. To visualize Owen's miracle is to make it unbelievable. It would be like those biblical movies of the 1950s and early 1960s. When the Red Sea actually does part, the audience just doesn't believe it.” The book has since been adapted into a stage play, a college production, and a BBC radio play.